The river separates Pench National Park into two halves, east and west Pench. The Pench Tiger Reserve derives its name after the Pench River, which flows from north to south across the reserve. The reserve is situated on the south of the Satpura Hill Ranges in the Seoni District and Chhindwara District in the Madhya Pradesh state of India. The topography is undulating, with most of the area enclosed by small hill ranges and abrupt slopes on all the sides. 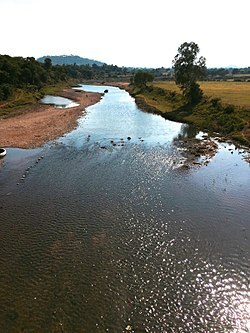 The Pench river flowing through the centre of the Reserve is usually dry by April, but a number of water pools, locally known as dohs, are found along the course of the river. These serve as waterholes for wild animals. A few perennial springs also exist in the region. Recently, a number of earthen ponds and shallow wells have been created, providing well-distributed sources of water across the reserve. The hydroelectric Totladoh Dam on the Pench River was the first interstate project of Maharashtra. It is located in the Pench National Park. The next big dam is Pench Dam near just downstream of the Totladoh Dam the town of Navegaon Khairylocated in Parseoni Taluka. More than 70% of the drinking water in Nagpur is supplied from the dams. The Pench right canal supplies water to Nagpur, the Koradi Thermal Power Station, and the Khaparkheda Thermal Power Station, and the rest of the water is use for irrigation in Parseoni taluka, Kalmeshwar taluka, Savner taluka, Kamthi taluka, and rural Nagpur. The Pench left canal irrigates Parseoni taluka, Ramtek taluka, and Mauda taluka and provides water for the NTPC Mauda Super Thermal Power Station and other industrial purposes. The planned Pench Diversion Project near the village of Machagora on the Pench River in Chhindwara district may spark a water war between Maharashtra and Madhya Pradesh. MP officials say construction of the dam near Machagora will provide irrigation to about 70,918 hectares of land in Chhindwara and Seoni districts. However, it is more about privatising water for two power plants of 1,320 mW each by major power companies Adani and SKS Limitedl. ^ "Nagpur Rivers". Retrieved 26 November 2014. This page was last edited on 27 November 2018, at 05:30 (UTC).